Planning a holiday to Europe in your caravan, trailer tent or fifth wheeler? We bring you some updates, if you’re planning, or already, towing your touring caravan, trailer tent or fifth wheeler outside of the UK to a European country (including Norway, Iceland, Switzerland, Serbia, Andorra or Liechtenstein). If you’re not planning on towing in the EU, there’s nothing you need to do. Whilst there’s still uncertainty surrounding what political agreement will be made on our exit from the European Union, and when this might happen, we know that many of our touring caravan, trailer tent and fifth wheeler customers will be planning European trips, or might already be in Europe. With that in mind, we’ve updated our information, to offer an insight into how Brexit may, or may not, affect your holiday planning. 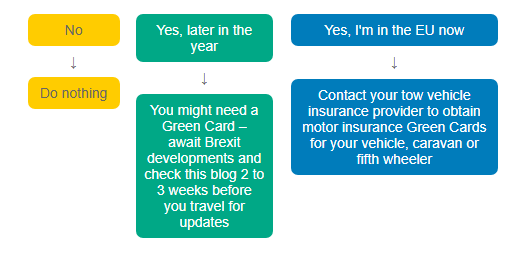 To make sure you can tow in the EU as normal, regardless of the Brexit outcome, it’s important to consider if you’ll need a Green Card and/or an International Driving Permit (IDP). 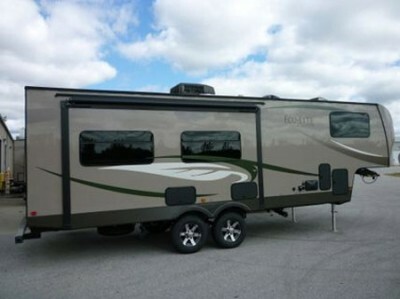 In some very limited circumstances, you might also need to register your caravan or fifth wheeler. EU leaders have agreed to an extension to Article 50, which means the latest deadline for Brexit is October 31st, 2019. However, Britain could still leave earlier than this if a deal is agreed before this date. If Brexit is delayed further or cancelled you should be able to tow within the EU as normal, without any extra documentation. What happens if the United Kingdom leaves the EU with a withdrawal agreement? It’s also likely that you can tow within the EU as you would normally, without the extra documentation mentioned above. However, until this is confirmed by the Government, we would still recommend requesting a Green Card and International Driving Permit (and where applicable register your caravan or fifth wheeler) as a precaution. What happens if the United Kingdom leaves the EU without a withdrawal agreement? You will legally need to carry a Green Card when towing in the EU. This also applies to travel across the Northern Ireland / Republic of Ireland border. You’ll also legally need to carry an International Driving Permit if you hold a UK licence. However, you should not need an IDP to travel across the Northern Ireland / Republic of Ireland border. 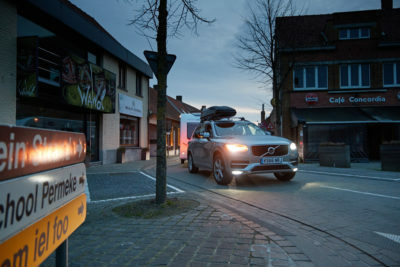 Will you be towing your tourer, trailer tent or fifth wheel caravan in the EU? If you need to request a Green Card, you should contact your tow vehicle insurance provider as a precaution – not your caravan insurance provider. We suggest you do this in good time before your holiday to make sure you get your Green Card on time. If you’re already in Europe, your tow vehicle insurance provider will likely have provisions set up to provide a Green Card. Please contact them to discuss. In the event of a no-deal Brexit, you’ll likely need an International Driving Permit (IDP) as well as your UK licence. The IDP is a multi-language translation of your driving licence and currently costs £5.50. These can be bought from a Post Office. There are three different types of IDPs, depending on the EU country you are driving in. You might need more than one if travelling through several countries. You can find up-to-date information on the Government’s website. If you hold a UK licence, you should not need an IDP to travel across the Northern Ireland / Republic of Ireland border, just your licence. 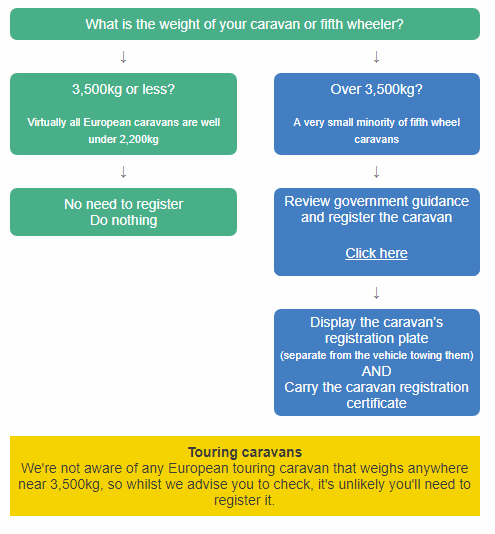 The Government has advised that in some scenarios non-commercial trailers, including caravans, weighing over 3,500kg, must be registered before they can travel to, or through, most European countries. This does not apply to travel across the Northern Ireland / Republic of Ireland border. 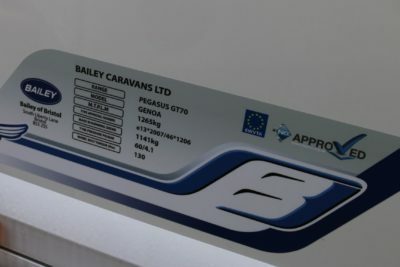 You can find the weights of your caravan on the information plate or sticker, which is usually found close to the door; on the side of your caravan; in the front locker; or in the door well. These figures will be the MRO or Mass in Running Order, which is the weight of the caravan when it left the factory. The MTPLM figure is the maximum legal weight of your caravan, fully loaded with equipment and possessions. Travelling to Europe with your caravan, trailer tent or fifth wheeler? Fifth Wheel caravans vary in size, and some will be over 3,500kg, so we strongly urge you to check (you can contact the supplier or manufacturer if you’re unsure or cannot find the weight). If you do need to register, it’s a relatively simple process which you can do online here. This currently costs £26, and you’ll need the VIN / chassis number. A Green Card is issued by your tow car insurance company and is a standardised document which is recognised at borders. It demonstrates that you have the necessary minimum motor insurance cover in place to be on that country’s roads. This also applies to travel across the Northern Ireland / Republic of Ireland border. Some European countries might also need a separate Green Card as proof of third-party liability insurance for your caravan, so you’ll need two Green Cards: one for your tow vehicle, and one for the caravan. Both of which are provided by the tow vehicle or car insurer. Drivers have to physically carry the Green Card with them when driving in Europe. A Green Card can include all the countries you are travelling to, so it can generally cover more than one trip. Obtaining a Green Card is precautionary. If the UK postpones or calls off withdrawal from the EU, or leaves with a renegotiated deal, or if the European Insurance Authorities confirm Green Cards will not be needed, then you might not need to carry one. If you’re a UK motorist, with a UK registered vehicle, you’ll generally continue to hold the same cover as you do now, it’s essential that you check this with your tow vehicle insurer for peace of mind. Our tourer, trailer tent and fifth wheel caravan insurance cover remain unaffected. Do I need a European Accident Statement form? This is a standardised carbonated document making it easier for drivers involved in an accident to exchange details and the facts of any incident. They are not compulsory, so you do not need to have one in your car. What documentation should I have when driving in Europe? When entering the EU you might be asked for documentation. The decision of what is needed will be for the individual border authorities. It’s also possible that you might be subject to police checks, or you might need to present documentation at the scene if you’re involved in an accident. As we don’t yet know the enforcement requirements applicable in a post-EU world, you might want to consider having the following up-to-date documents to hand when driving in Europe or the EEA. Your tow vehicle insurer might have specific advice about your policy. Having the following documents might be precautionary, but could offer reassurance that your travel plans will go ahead as anticipated. Vehicle registration document (V5C) – the government recommends you carry this. The Government has guidance about preparing to drive in the EU after Brexit, as well as information about visiting Europe, passports, travelling to Europe with pets, taking a vehicle out of the UK for less than 12 months and the European Health Insurance Card (EHIC).